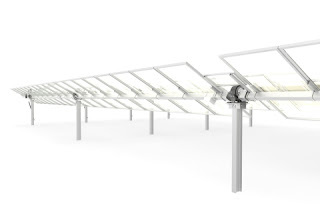 LAS VEGAS, NV--(eSolarEnergyNews)-- SunLink Corporation expands its broad portfolio of photovoltaic project solutions with the launch of the TechTrack Distributed single axis tracker. TechTrack Distributed introduces a new era in solar tracking with “dynamic design,” unrivaled site flexibility and reductions in total project costs. TechTrack Distributed is the second single-axis tracker in the company’s TechTrack product line, joining the internationally deployed TechTrack Centralized. Central to the system’s innovation is a dynamic design feature called Dynamic Stabilization™ through which the characteristics of the tracker are changed depending on real-time, sensor-observed environmental conditions. Beyond simply adjusting tilt, SunLink’s TechTrack Distributed incorporates control over the damping and stiffness of the array, opening a completely new solution space for increasing energy output, maintaining structural integrity and lowering cost. In addition, TechTrack Distributed solves the challenge associated with monitoring the thousands of electromechanical parts that make up a distributed tracker system via SunLink’s VERTEX Project Intelligence Platform. VERTEX enables next-generation real-time data monitoring and secure remote control, which provides greater visibility into energy assets, historical data collection and more efficient O&M – resulting in more valuable energy projects. Superior structural efficiency – Maximum system torque is reduced by 67 percent, resulting in a stronger, lighter and more cost-effective tracker. Increased power – Continuous tables and 120° tracking yield the industry’s best power density and generation. Reduced fieldwork – Terrain following of 10 percent grade N-S, any practical E-W and up to 5 percent change in grade post-to-post. Fewest posts to install of any comparable tracker. Wireless and self-powered – Integrated solar panel and Li+ battery power, robust slew drive and motor. Communication via secure, proprietary mesh network. Unlike any other tracker provider on the market, SunLink also offers PowerCare installation and O&M services for TechTrack projects, making it possible for EPCs and developers to take on more projects successfully. With both distributed and centralized tracker solutions as well as fixed-tilt and roof-mount products, SunLink’s full range of respected solar mounting products is able to meet the requirements of virtually any project site, anywhere in the world.